What are some good examples of rails converted into public trails? The best trails provide a functional transportation alternative or are a destination location like a major park. What are some of the best? Route maps would also be appreciated! Indiana has many rail to trail conversions. 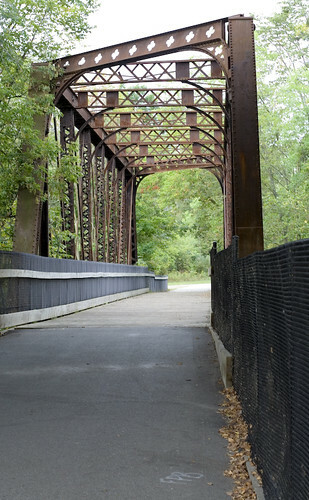 Indianapolis has the Monon Trail, which in itself is a major destination and connects many areas of the city. Huge transportation route as this feeds into the downtown area and a few neighborhood hotspots. Additionally, the Cardinal Greenway in Muncie, Indiana is another conversion that begins in the downtown area and heads out through rural areas. It connects in the downtown with a minor greenway and the city street grid to link up with Ball State University, which is a few blocks from downtown. I went to Ball State when construction was wrapping up on this, and I thought I had heard from professors one reason the greenway was constructed, other than recreational, was to also preserve the corridor for future commuter/ light rail. Here in TN, the Cumberland River Bicentennial Trail about 30 minutes west of Nashville is another. It utilizes an old trestle, which is interesting. It's in a little more of a secluded area, so not really utilized as a transportation alternative. I'll have a few photos in a couple of days and will post them when I have them edited. This appears to be an valuable resource as well. A little digging should provide many, many greenways falling under this category. In SW VA there is the "Virginia Creeper Trail." It also crosses the Appalachian Trail. We like to go up to Damascus and take a shuttle up to White Top. From there it's still a few hours down at a liesurely pace, but it's mainly downhill so it's easy to get a group together for that. Though still in the planning stage, Detroit's Dequindre Cut will be a nice example of an old rail ditch into a public greenway. It will connect the East Riverfront to (Mies VanDerRoh) Lafayette Park, and on to Eastern Market at Gratiot. Currently, funding is being finalized in conjuction with a master planned renovation of Eastern Market. The plan for the cut is to have a recreation trail on one right of way and a trolley-type transit line on the other. Looking south toward Canada. The land furthest away would actually be across the river. There are a bunch of these trails in Pittsburgh. We've got the American Tobacco Trail here in Durham. It connects to a few other trails, making a pretty decent regional trail network. It's also a part of the East Coast Greenway. Great list so far folks, keep them coming! The Burke-Gilman, Sammamish Trail is a linear thread of three trails stretching 38 miles from Puget Sound in Seattle to the Cascade foothills in Issaquah. The trail links many neighborhoods, parks, and destinations. A 2 mile stretch of the trail runs through the University of Washington campus. It also follows Lake Washington, the Sammamish River through winery country, and along Lake Sammamish. The other great trail system is the Trail of the Coeur d'Alenes/Route of Hiawatha in Idaho and a tiny bit of Montana. It stretches from Plummer, ID in the Palouse near the Washington border, across and along Lake Coeur d'Alene, and up the Silver Valley to Lookout Pass where it meets the Route of Hiawatha, one of the most scenic rail corridors ever constructed. Eventually these two trail systems will be linked by the John Wayne Pioneer Trail, creating a single trail from Seattle, Washington to St. Regis, Montana. 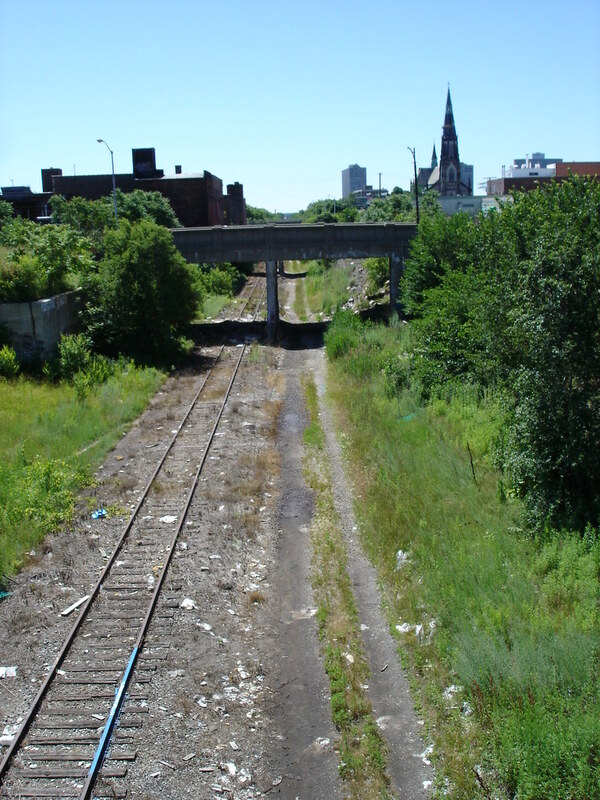 The John Wayne Trail follows the old Milwaukee Road and is undeveloped in most places. Fences and land disputes are hindering progress. The White Pine Trail is an old rail corridor and goes from the North side of Grand Rapids and travels 92 miles North to Cadillac, Michigan. It's paved in 3 sections, a 13 mile section from Grand Rapids to Cedar Springs, 13 miles from Big Rapids to Reed City, and a mile of trail in Cadillac. It's officially a Michigan State Park. Wow, I never knew about that trail. Are there any plans to extend it through Grand Rapids? Thanks for the bit o' education! There is an excellent Rails to Trails trail in Hattiesburg, MS called the Longleaf Trace. I think it's about 40 miles long and there are plans to extend it all the way into to Downtown Hattiesburg, and eventually into the planned Chain Park at Twin Forks (proposed park in Downtown Hattiesburg) when that is completed. It features a major gateway at The University of Southern Mississippi and has several smaller "rest stops" along the way. The trail is smooth and has good shade all along, not as much now after Katrina though. Definitely worth checking out if your in the area. Also on this trail is the planned Beaver Lake Educational Center. Here's a link to the website for the Rails to Trail here. Missouri's Katy Trail follows the former route of the Missouri-Kansas-Texas (KATY) railroad across much of the state, and follows the Missouri River between St Charles and Boonville. It's about 250 miles, with varied terrain and lots of history and scenic beauty. I read they're bridging the gap between the Great Allegheny Passage and the C&O Canal Path, which will provide a link between DC and Pittsburgh. We have the Tammany Trace S. Louisiana. How are most rails to trails projects structured as far as ownership? Are the corridor examples (very nice! ), provided in this thread still owned by the rail companies, or are they owned by the municipalities? I'd love to see the route of the Richmond-Rappahannock River Railroad become a trail... but it'd be a trail to nowhere. It would go through several neighborhoods and then it goes into forests and swamps along the Chickahominy River and I guess it could stop near Gaines Mill Battlefield. I believe a part of it is someone's driveway. I've lost the route past that point, but it picks up along a road in the forest and cuts across several properties and ends at the Pamunkey River. Maybe the suburban stretch of it? Most likely they are not owned by the rail companies but by county / city park divisions. But I guess there could be cases of rail companies leasing the rail ROW for these purposes. It is very nice. It is currently about 40 miles long, but it is expanding and will eventually go all the way into Alabama and will be over 100 miles long.